UPDATE: The 'Eerie Eric' painting is now on sale HERE. 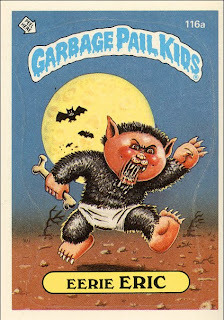 As a kid, there wasn't anything as cool to me as baseball cards, comic books, action figures, Mexican candy and Garbage Pail Kids. They really did define childhood and when I see any of those things, I'm instantly brought back to those days. I think the combination of the Mexican candy and GPK cards really affected my brain and shaped the twisted sense of humor that I have now. 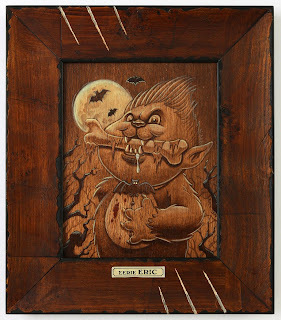 Gallery 1988 had the awesome idea to ask a bunch of artists to re-interpret their favorite Garbage Pail Kids. I always liked the werewolf know as 'Eerie Eric' for obvious reasons so I chose to work on him. Instead of working digitally and doing the prints I usually do, I decided to pick up a paintbrush and acrylics and do it old school just like they would have in the 80's. I found painting to be such a nice & relaxing change. When I think about it, I'm in front of the computer pretty much all week, so breaking away was a good thing. 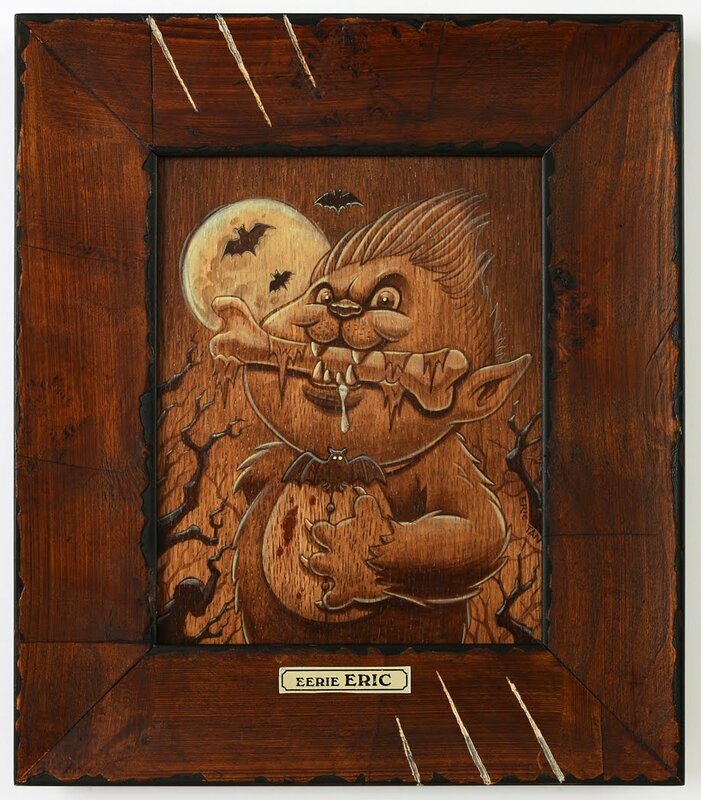 With my version of 'Eerie Eric', I paid homage to the original by using the same elements such as the moon, the trees, the bats, and his bone. I changed it up a bit by giving him a tuxedo shirt, a little bat bow tie, and more of a distinguished gentleman type of attitude. That's the part of me that I added. I'm not necessarily as suave, but I try. The painting itself is 8" by 10" and is painted on oak. My friend Mike helped shred the frame and I got the bronze nameplate from a trophy shop. Be sure to check out the show if you can. It starts September 2nd.